We will detail on this page the dog tick diseases, and show you how tick removal dog or dog tick removal is done so you can rid your canine of these nasty little creatures. One way to treat ticks is with a natural flea and tick control. Ticks are a mite that feeds off the blood of host animals. These creatures will typically perch on grass and will wait for a host animal to walk by. It will then attach itself to the body of the animal and will seek out a warm, dark and moist area where it will be able to easily attach itself and consume blood, typically their ears, face or stomach. Here is a picture a male and female dog tick affixed to the skin of a dog. You can see that inflammation has already started. This is done with a probe that will penetrate the skin. When it is done consuming, the tick will remove the probe and hide on the animal. The tick is part of the spider family so it has to be a nuisance ! There are a number of different ticks out there. The American dog tick and the Brown dog tick are those most found in the states. Still more ticks are the Western Black Legged tick and the troublesome deer tick that is the one who usually carries deer tick (Typically, the dog tick is going to carry dog tick diseases that can be different diseases than some of the other species. However, if you take your pet out in the wild, you can potentially run into some of these other diseases, so here is a complete list of the types of diseases that are carried by ticks. Prevention is one of the best ways to avoid your canine getting any tick diseases. 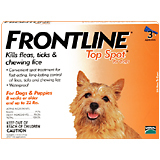 I have always used Frontline Plus on all my dogs because it kills ticks, unlike Advantage that will not kill ticks. If you find a dog tick on your pet, dog tick removal should be done as quickly and safely as possible. One of the worst tick removal dog solutions people will try to do is to light a flame and try to get the tick to let go. More pets are hurt with this dog tick removal method than ticks are actually removed. Because of this, an alternative approach will be important. You need to know that ticks do have a set of teeth that will curve back to secure them into the flesh of the creature they have bit. What you need to do is to get the tick to remove its grip by immobilizing it. This can be done by taking some rubbing alcohol and placing it on them. As soon as the grip of the tick has been loosened by this dog tick removal method, you will want to take a pair of tweezers and carefully remove them. Keeping in mind that when a tick removal dog procedure is done, their heads do come off easily and you don't want that stuck in the skin of your dog as it can lead to infection. Once the tick has been removed then use the same rubbing alcohol on the affected area and then apply some antibiotic ointment. It is a good idea to also cleanse your tweezers with rubbing alcohol. The bite area should be closely watched in the following few days for infection. When removed, you will want to place the tick into a bit of rubbing alcohol to ensure that it dies. From here, you may want to take the tick you have removed and your dog down to the vet to have them checked out. That way you can ensure that your dog is fine. You must flush the removed ticks down the toilet. Never toss them in the trash or outside. While dog ticks can be a nuisance, they are an easily treated problem that you can get under control in a very short period of time and prevent dog tick diseases.